"Yummy milkshake for those hot summer days!" Place the frozen banana chunks, powdered drink mix, milk, and vanilla ice cream into a blender, and blend until smooth and creamy. Pour into large glasses. wow this was so simple and very easy to make. In place of powdered drink mix, I used a chocolate hazelnut spread and it turned out really yummy. You won't be able to put this drink down! Awesome! I substituted chocolate ice cream instead of vanilla for an extra chocolate boost, and it was delicious! This was great..I loved it very much..Perfect!!! Excellent recipe! You can taste both the banana and the chocolate. My favorite homemade milkshake! I used homemade greek frozen yogurt in this recipe instead of vanilla ice cream. I also cut back on the milk a bit. Surprizingly good! I loved it! It was delicious and super easy to make! 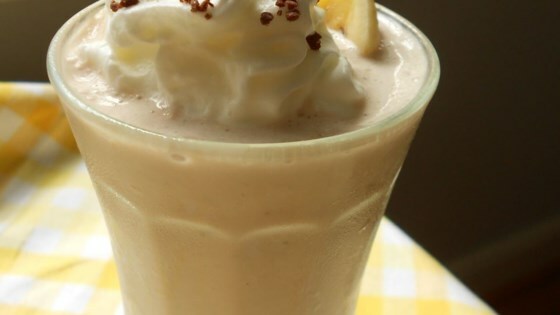 I love banana milkshakes this is my favorite!